This web page is a checklist for securing the three most popular web browsers: Microsoft Internet Explorer, Mozilla Firefox, and Opera Web Browser. The general perspective taken within this document is to achieve a secure computing environment. The easiest way to achieve this level of security is to process the list for your particular browser, following the instructions for each item, and checking off each item along the way. Keep in mind that the points made in this checklist are only recommendations to help harden the web browser, they are not set in stone. You may find that a certain setting is too strict, in which case you may relax is particular setting. Keep in mind that this relaxing will impact the level security for your web browsing environment. Each of these web browsers hold a different portion of the people who surf the World Wide Web. This amount of usage will typically dictate the amount of attention that creators of malware (a.k.a hackers) will give to the web browser. The general thought concept behind this checklist is for a web browser user to add an addition layer of defense between themselves and the World Wide Web. Please keep in mind that each browser is continually being updated to address security issues and provide its users with new functionality. This will result in new settings and typically the manner in which the settings are presented to the user. The checklist below were created with the newest versions of each browser and this version number is mentioned for your reference. We take no responsibility whatsoever for the implications that these settings will have on your computer. It is suggested to try these setting changes on a test machine prior to changing your computing infrastructure. We have tried to provide the consequences of each setting, but there is no doubt many more exist. Suggests and a comments are always welcomed. The main intentions behind these settings are to protect the browser user from unknowingly providing personal information to a potential attacker, and to increase the user's awareness of their browsing environment. While browsing, the user is then able to make more intelligent decisions without the browser doing something they are unaware of in the background. It is common place for the browser developers to create options that facilitate the user's browsing experience, however these conveniences often take away from the security that should be considered while online. The checklist steps that below are followed by a detailed description of why the steps are necessary. Copyright © 2003 by Hal Berghel, Jacob Uecker, Paul Braeckel. All Rights Reserved. On the Toolbar menu, click Tools pull-down menu. Note: The Toolbar menu is the bar at the top of the Internet Explorer window. This will provide the Internet Options window, which has a tabbed interface for adjusted the browser's settings. Internet Explorer divides its Internet Settings into seven (7) tabs. We will be looking at the General, Security, Privacy, Content, and Advanced tabs. In the instructions that follow, all references are made to the options within the tabbed window unless specified. Change the radio button for Check for newer versions of stored pages: to Every visit to the page . In the History box, click the button Clear History. Change the value to the right of Days to keep pages in to zero (0). Click the Delete Cookies... button. There are four (4) zones listed under Select a web content zone to specify its security settings., click on the first zone Internet. In the Security level for this zone box, click on the Default Level button. Repeat these two previous steps for zones Local intranet, Trusted sites, Restricted sites . In the Security level for this zone box, click on the Custom Level... button. Change the setting Java VM - Java permissions to Disable Java. Change the setting Scripting - Active Scripting to Disable. In the Cookies box, check the checkbox in front of Override automatic cookie handling. For the option First-party Cookies, select the radio button Prompt. For the option Third-party Cookies, select the radio button Prompt. Uncheck the check box in front of Always accept session cookies. Check the checkbox in front of Block pop-ups. Set the Filter Level: to High: Block all pop-ups. Change the setting Miscellaneous - user Pop-up Blocker to Enable. In the Personal information box, click on the AutoComplete... button. Uncheck the checkbox Web addresses. Uncheck the checkbox User names and passwords on forms. Click the Clear Passwords button. There is a checkbox in front of each of these options to indicate if the option is enabled or disabled. A check indicates the option is enabled and no check indicates that the option is disabled. In the Settings: box, scroll down to the Browsing section. Check Automatically check for Internet Explorer updates . Uncheck Enable Install On Demand(Internet Explorer) . Uncheck Enable Install On Demand (Other) . Uncheck Enable offline items to be synchronized on a schedule . Check Notify when downloads complete . Uncheck Use inline AutoComplete . In the Settings: box, scroll down to the Java (Sun) section. Uncheck Use JRE 1.5.0_04 for <applet> . In the Settings: box, scroll down to the Microsoft VM section. Uncheck Java console enabled . In the Settings: box, scroll down to the Security section. Check Check for publisher's certificate revocation . Check Check for server certificate revocation . Check Check for signatures on downloaded programs . Check Do not save encrypted pages to disk . Check Empty Temporary Internet Files folder when browser is closed . Uncheck Enable Profile Assistant . Uncheck User SSL 2.0 . Check User SSL 3.0 . Check User TLS 1.0 . Under Tools, click on Options... menu option. This will provide the Options window, which has a tabbed interface for adjusted the browser's settings. The left hand side of the Options Window shows five icons, or five categories of settings. We will be looking at Privacy, Web Features, Downloads, and Advanced. The options for each of these categories are listed in the right hand window when the icon is highlighted. In instructions that follow, all references are made to the options within the Options window unless specified. If there is a plus sign in front of the History options, expand the History options by clicking on this plus sign. If there is a plus sign in front of the Saved Form Information options, expand the Saved Form Information options by clicking on this plus sign. If there is a plus sign in front of the Saved Passwords options, expand the Saved Passwords options by clicking on this plus sign. Uncheck the checkbox in front of Remembered Passwords. If there is a plus sign in front of the Download Manager History options, expand the Download Manager History options by clicking on this plus sign. Click the Clear button to the right of Download Manager History. In the dropdown box after Remove files form the Download Manager, select When Firefox exists. If there is a plus sign in front of the Cookies options, expand the Cookies options by clicking on this plus sign. Click the Clear button to the right of Cookies. Uncheck the checkbox in front of Allow sites to set cookies. If there is a plus sign in front of the Cache options, expand the Cache options by clicking on this plus sign. Click the Clear button to the right of Cache. Check the checkbox in front of Block Popup Windows. Click on the button Allowed Sites. In the Allowed Sites window that opens, click Remove All Sites. In the same window, click the OK button. Uncheck the checkbox in front of Allow web sites to install software. Check the checkbox in front of Load Images. Check the checkbox in front of for the originating web site only. Uncheck the checkbox in front of Enable Java. In the Download Folder box, select the radio button in front of Save all files to this folder:. Scroll to the top of list of folders and highlight the Desktop folder by clicking on it. Click on the Make New Folder button. Type the name "Downloads" for this folder. This is the folder on your Desktop where all your downloads will now be saved. Check the checkbox in front of Show Download Manager window when a download begins. Uncheck the checkbox in front of Close the Download Manager when all downloads are complete. In the File Types box, highlight the first item in the box under Automatically perform the associated action with each of the following file types: by clicking on it. Repeat this process to remove all entries listed in this box. Scroll down to the Software Update option in the right hand pane. If there is a plus sign in front of the Software Update option, expand the Software Update option by clicking on this plus sign. Check the checkbox in front of Firefox. Check the checkbox in front of My Extensions and Themes. Click on the button Check Now. When Firefox is finished looking for updates and installing them, click the Finish button. Scroll down to the Security option in the right hand pane. If there is a plus sign in front of the Security option, expand the Security option by clicking on this plus sign. Uncheck the checkbox in front of Use SSL 2.0. Check the checkbox in front of Use SSL 3.0. Scroll down to the Certificates option in the right hand pane. If there is a plus sign in front of the Certificates option, expand the Certificate options by clicking on this plus sign. In the Client Certificate Selection box, check the radio button Ask Every Time. Scroll down to the Validation option in the right hand pane. If there is a plus sign in front of the Validation option, expand the Validation option by clicking on this plus sign. In the OCSP box, select the radio button in front of Use OCSP to validate only certificates that specify an OCSP service URL. 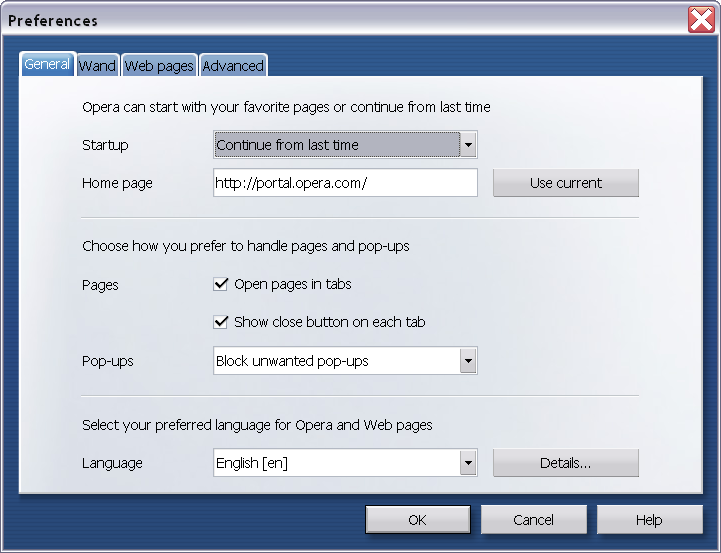 Open the Opera web browser. On the menu bar, click Tools pull-down menu. Note: The Toolbar menu is the bar at the top of the Opera window. Under Tools, click on the Preferences... menu option. This will provide the Preferences window, which has a tabbed interface for adjusted the browser's settings. Opera divides its Preferences into four (4) tabs: General, Wand, Web pages, Advanced. We will look at the settings under the General, Wand, and Advanced tabs. In instructions that follow, all references are made to the options within the Preferences window unless specified. In the drop down list to the right of Pop-ups, select Block unwanted pop-ups . Click on the Wand tab. Uncheck the checkbox in front of Let the Want remember passwords . Uncheck the checkbox in front of Cookies . Check the checkbox in front of Wand logins . Remove each entry by clicking on it followed by clicking the Delete button. In the fields under Opera can auto-complete forms with your personal information, delete any personal information in these fields. In the list of advanced options on the land hand pane, click on the Content group of options. Uncheck the checkbox in front of Enable Java . In the list of advanced options on the land hand pane, click on the Downloads group of options. Under Download directory, click on the Choose button. Browse to the Desktop, which is typically the directory at the top of the directory tree. Highlight this Desktop directory by clicking on it. Click the Make New Folder button. In the list of advanced options on the land hand pane, click History group of options. Change the drop-down menu for Typed in addresses to zero (0). Click on the Clear button to the right of Typed in addresses. Change the drop-down menu for Visited Addresses to zero (0). Click on the Clear button to the right of Visited Addresses. Change the drop-down menu for Memory cache to Off . Change the drop-down menu for Disk cache to Off . Click on the Empty now button to the right of Disk cache. Check the checkbox in front of Empty on exit . In the list of advanced options on the land hand pane, click Cookies group of options. Change the drop-down menu for Normal cookies to the Let me decide every time I receive one option. Change the drop-down menu for Third party cookies to the Let me decide every time I receive one option. Click on the Manage cookies... button. Check the checkbox in front of Cookies . Uncheck the checkbox in front of Wand logins . Check the checkbox in front of the Delete new cookies when exiting Opera option. Uncheck the checkbox in front of the Accept cookies with incorrect paths option. In the list of advanced options on the land hand pane, click Security group of options. Click on the Security protocols... button. Uncheck the checkbox in front of the Enable SSL 2 option. Check the checkbox in front of the Enable SSL 3 option. Check the checkbox in front of the Enable TLS 1 option. Check the checkbox in front of the Enable TLS 1.1 option. In the list under Select ciphers to enable , uncheck all Cipher with Version SSL 2. In the list under Select ciphers to enable , uncheck all Cipher less than 128 bit. Check the checkbox in front to the Warn me before submitting forms insecurely option. These settings dictate how Firefox handles information concerning the user's browsing experience, in particular information about the user and the websites that the user visits. Typically, these settings provide features to make surfing more convenient for the user, and not imperative for using the browser. A general rule of thumb is that is not a good idea to let the browser gather information about its user. Although it provides a convenience to the user, this personal information must be stored locally on the browser's computer and is just as easily accessed by the browser as well as malware. The suggestions made for these settings will allow the user to secure their identity while online. This browser will remember links to the websites that it has recently visited. By setting the value to zero, the browser history is in effect disabled. The result of disabling the browsers history is that malware and spyware are not able to harvest surfing trend information and other personal information about the user from the browser's history log. This may have a slightly annoying effect because the user is not able to look up URL addresses that they have recently visited. However, the user may also achieve the history effect by creating Bookmarks for each desired URL address. The browser will remember information that is entered into webpage forms and the browser Search Bar. The intention here is facilitating the user's web browsing experience by automatically making suggestions when you enter information again. It is best to not allow the browser to save any information that is entered into a web form. Although it is convenient for the user to have the browser complete webpage forms, it is just as easy for malware to access this saved information. This may have be annoying for some users since they will have to enter their personal information into all web forms, but it will not impact the users browsing experience. The browser will remember user passwords that are entered into webpage login forms in its Password Manager. The intention here is convenience for the user not to recall their username and password when visiting sites that require them to login in order to access the webpage. For example, the user may allow the browser to save their password for their online banking account, and when they access this banking web site from the browser with their password saved, the browser will automatically enter their password. It is best to disable the browser's ability to recall user passwords. Although it is convenient for the user not to enter their login information every time they access the website, it is just as easy for malware to access this saved information. This may be a slightly annoying on the user because they must enter their password on each website that requires a password, but it will significantly reduce the ability of malware to capture their password information. Firefox does allow the user to password protect the password information that it stores. In theory this will help protect the user's password information, however it best to disassociate your password information from the browser. There are password managers that are not associated with browsers and more secure at managing password information. The browser stores shortcuts to all the recent downloads that are initiated by the user, such as office productivity software Microsoft Word, an Adobe PDF file, or hardware driver software. It is best to keep this list of downloaded files clear so that what is being downloaded may be used by malware or prying eyes. Keeping this list of downloads clear will have no effect on the usage of the browser. It is general good practice to use the Download Manager to verify when a download is complete, and then clear the list afterwards. A cookie is identifying information that is sent by a webpage to your browser and stored locally as a file on your computer when a webpage is accessed by that browser. A copy of this cookie is then sent back by the browser to the server every time browser access that server. Since it is theoretical impossible for a website to keep track of all of its users, the intention behind cookies are to store its user information on the user's computer. This information is typically unique to that the user's browsing experience. For example, a cookie may contain information for an online shopping cart to keep track of and tell the website what the person has chosen to purchase. Since this sensitive information is used to identify a user, disabling cookies will not allow the browser to accept cookies and potentially store personal information that might be accessed by malware. Check the checkbox in front of Allow sites to set cookies. In the drop down box after Keep Cookies:, select until I close Firefox. Under the cookies option, click on the Exceptions button. 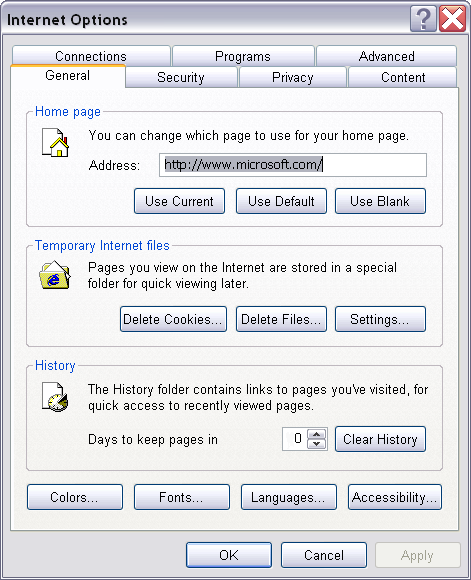 In Address of the web site: in the Exceptions window, enter the URL of the webpage that you would like to set cookies on your computer. This will allow the entered web site to set cookies, so sensitive information may be available for a malware attack and caution should be taken to protect this information stored in the cookies. When a webpage is accessed, the browser will save the webpage locally on the computer. The next time this webpage is accessed, the browser will check if it has been previously saved, and if it has been saved, it will load the webpage from the locally saved copy. The intention here is to expedite the user's browsing experience, because the computer does not have to download the webpage again. This information includes all necessary components (HTML, images, scripts...) necessary to display the web page and is stored locally in a temporary directory on the computer. This information may be accessed like any file on the computer by searching the computers file system directories. By setting this value to zero, the cache is disabled. It is suggested that the cache be disabled to avoid malware and spyware from accessing the history of the visited web pages. The user's browsing experience will be slightly slower because the browser must download a webpage every time that the user wants to see the webpage. This will not be as apparent with faster Internet connection because the browser is able to quickly download the newest version of the webpage, and the need to store temporary files on the computer is not necessary. However, this will be very obvious in a computing environment where the Internet connection is slower, such as with dial-up connectivity. In this situation, the user may elect to allot a certain amount of disk space for caching of web pages; the default disk space that Firefox allots is 50MB. 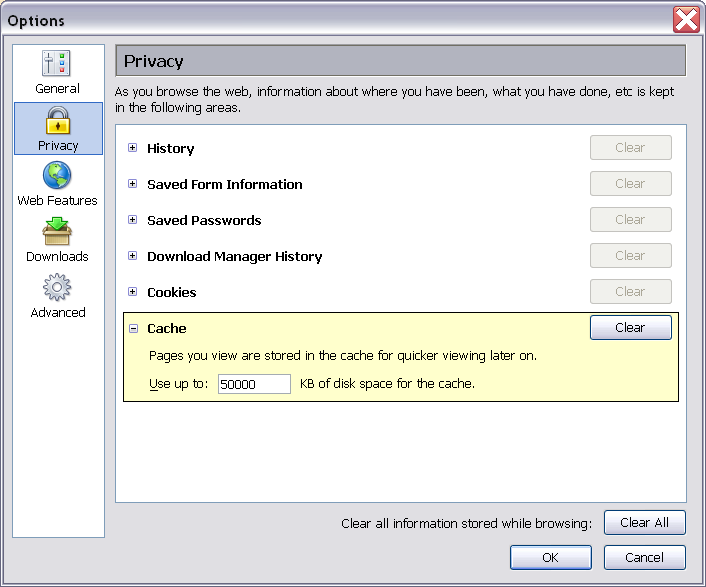 In this situation, it is suggested that the user Clear the cache when closing the browser to avoid having these temporary internet files on the computer. Pop-ups are windows that are automatically opened by the browser forcing the user to view the displayed information. Although some websites use pop-ups legitimately to show information that is pertaining to but not part of the website's information, generally they are used as online advertising and considered annoying. The default setting for Firefox is for it to block pop-ups, and this is the suggested setting to reduce the annoying nature of a popup. Click on the Allowed Site button to the right of Block Popup Windows. In the Allowed Sites window that opens, enter the exact URL of the website you want to allow pop-ups into the box under Address of web site:. Repeat this steps to add additional websites. Highlight the website by click on its URL in the list of sites on the Allowed Sites window. Click on the Remove Site button. Repeat this steps to remove additional websites. Firefox allows the user to add functionality and customize their browser by installing modules of software in the form of extensions, add-ons, and themes. It is generally not a good idea to allow websites to install software on your computer; it is far too easy to be install malicious software disguised as something legitimate. This functionality may be disabled by unchecking the checkbox in front this feature, and this is the suggested setting. Click on the Allowed Site button to the right of Allow web sites to install software. The user should be very skeptical of the sites that they allow to install software. It is common practice for malware to emulate trusted sites. The default setting for Firefox is to load the images on a web page in order to allow for a pleasant surfing experience. Some websites, however, load images from a server other the one hosting the website, such as with a third party advertising site. A potential side effect of allowing these third party images is web bugs or other hidden graphics. A web bug is a obtrusive graphic used for monitoring web traffic, profiling a persons surfing habits, profiling what type of browser being used, counting the number of hits for a web pages and is typically loaded from a web server other than the one hosting the web page. In order to avoid these web bugs, it is suggested to enable loading images for the originating web site only. Right click on the image on the web page being viewed. In the context menu that appears, click Block Image from < server name >. Click on Tools on the Firefox menu bar. Click on the Exceptions button to the right of Load Images. In the Exceptions window, the site the you blocked will be listed. Java is a popular platform-independent programming language that is able to create web applications, however it is a common target for malware authors. Malware takes advantage of the fact that it is executable code, which is typically automatically downloaded and executed on your computer. Numerous exploits exist that use Java to compromise a computer and the data stored on it. Disable Java within Firefox by unchecking this feature, this is the suggested setting for this option due to Java's popularity as a language for creating malware. Java is self standing application called an applet that is used to create interactive web content (games, animations, printing features...) and web based applications (mortgage calculators, image manipulations, virus scanners...). If java is not disabled, Firefox will not allow any of the functionality achieved through the Java applets. This will impact your browsing experience because the content provided by web sites for legitimate purposes will be blocked. The benefit though is that the potential threat from Java based malware is eliminated. make a note somewhere that these settings should be checked on a regular basis to promote consistency of settings. These options determine how Firefox handles downloaded files. The setting made for these options will determine how secure the user's system is in respect to what is downloaded from the Internet to the user's computer. This allows the user to select one folder in which to save all the downloads from the Internet. It is suggested to save all downloads that you initiate to a centrally located folder. This facilitates scanning of downloaded files, since they are centrally located. Keep in mind that these downloads are not the temporary files that Firefox keeps when downloading web pages. There are no consequences to saving to other locations, however, the user is better able to manage their system by saving all downloads to one file folder. On the Firefox menu bar, click on Tools. There is not consequences to not using disabling the Download Manager, however, the user is better able to manage their system because they have a reference for all the downloads. This option allows Firefox to automatically perform a specified action for a downloaded file based on the file's file type. When a file is downloaded, if the user has associated an executable with the file extension of the downloaded file, Firefox will launch the executable to load the downloaded file. If there is no association with the downloaded file's extension, Firefox will save the file to the specified download Folder. This is something that is built into Microsoft Internet Explorer; however, it is suggested not to automatically perform actions on download files so all files should be removed from this list. Firefox will reference this list every time a file is downloaded; if the file type is not on this list it will add it to the list and prompt the user for an association for this new file type. It is suggested that the user select Save to Disk. There are no consequences with adjusted this setting, in fact it will allow the user to better manager their system because they will have to manually associate the downloaded file with the executable to run it.